(SEOUL) November 4, 2011 — Just a couple months after its launch, the sporty Kia Picanto three-door model, available exclusively in Europe, has been honoured with the coveted iF product design award 2012. This award recognizes design quality alongside a number of other criteria, including workmanship, level of innovativeness and eco-friendliness. 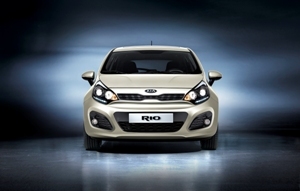 It is the first time that Kia has offered its popular A-segment Picanto in three-door form. For Kia Motors this is the fourth iF product design award in three years, following prizes for the Venga B-segment MPV (2010), Sportage compact SUV (2011) and Optima mid-size sedan (2011). Additionally, the brand has won the red dot design award four times in recent years. The 3.6-metre long Kia Picanto boasts bold and dynamic styling, high-quality interior fittings and host of class-leading features. It is specifically aimed at discerning customers, especially the steadily increasing number of consumers who wish to ‘downsize’ and switch to a smaller car. In most markets, Picanto is available with two highly efficient petrol engines (51kW and 63kW) which, in combination with the optional automatic stop-start ISG system, reduces CO2 emissions to as low as 95 g/km. Kia’s unique 7-year/150,000 km Warranty comes as standard on all Picanto cars sold in Western Europe countries. A five-door bodystyle of the Picanto is available in most global markets. In Europe, the three-door version is expected to account for 36% of total Picanto sales. Through the first nine months of 2011, the Picanto (new generation and first generation combined) is one of Kia’s best-selling models globally, with 179,405 units delivered. Since its launch in 1953, the iF product design award has been conferred annually and is among the world’s most important prizes for excellence in design. The award has its origins in the “Die gute Industrieform” (Good Industrial Design) product shows initiated by Hanover Messe and is now one of the world’s largest design competitions. For 2012, a total of 2,923 products were registered in 16 different categories. The Kia Picanto was honoured in the ‘Transportation Design’ category, which includes cars, ships, trains and aircraft. The official presentation ceremony for the iF product design awards 2012 will take place on 10 February 2012 during the Munich Creative Business Week. All the winning products will be on display at the Hannover Exhibition Centre (6-10 March 2012), the iF design exhibition in Hamburg and at a subsequent iF design exhibition in Hainan, China.